“Mark, but if I eat all this fat, maybe I’ll look good, but what about my health?” UGH! It’s one of the questions I get asked most about diet…and I hate it! Only because it just never goes away. I think it’s safe to say that the vast majority of people are totally confused about cholesterol. Why? Bad information. Actually, scratch that – TERRIBLE information! I mean, high cholesterol is bad isn’t it? Well actually, total cholesterol levels tell you NOTHING about your health. Given that half of all heart attacks occur in people with “normal” or even low cholesterol levels, something is up here. 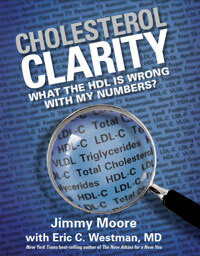 Enter Jimmy Moore, like some sort of superhero of the cholesterol world, to set the record straight with his new book Cholesterol Clarity. If you have any concerns or confusion about low-carb high-fat, heart health, and/or cholesterol, you need to read this interview. Jimmy also has his own inspirational weight loss story, which ignited his passion and lead him to become and educator on all issues low-carb. But I’ll let him tell you about that himself. Jimmy, you are going to be new to a lot of my readers. I know you used to weigh 410lbs. Can you tell us a little bit about your story and how you lost a phenomenal amount of weight? Before 2004, I was a morbidly obese man weighing in at 410 pounds, wearing size 62-inch waist pants and 5XL shirts, taking three prescription medications for high cholesterol, high blood pressure and breathing problems—I was literally a ticking time bomb in my health at the age of 32. My mother-in-law gave me a copy of Dr. Atkins’ New Diet Revolution for Christmas in 2003 after trying and failing on so many low-fat diets off and on over the years. This book said just the opposite—eat more fat and less carbs to not just lose weight but to radically improve your health. It went against everything I ever believed about nutrition and healthy living. But everything else I’d ever done before had failed me and I felt like giving it a shot beginning on January 1, 2004 to see how it would work. In the first month I lost 30 pounds, another 40 pounds in the second month, by the end of 100 days I’d lost 100 pounds. And although I had a 10-week stall where I didn’t lose any weight on the scale (but I still lost 6 inches off of my waist), I knew I was doing something right for my body for the first time in my life. I had no hunger, no cravings, incredible robust energy, clearer thinking while eating delicious formerly-forbidden foods like butter, full-fat meats and cheeses, eggs and more. By the end of 2004, I had dropped a total of 180 pounds with a renewed purpose and mission for my life. Wow!! And God bless your mother-in-law! I know that when I was doing a low-carb diet, I heard from people all the time about what all that fat was going to do to my cholesterol. Did you get this from family and friends as well? Were you concerned about it early in your Atkins journey? You know, most of my friends and family just wanted me to lose weight so badly that they didn’t really care how. But despite losing 180 pounds, so many of them were perplexed when I’d eat high-fat foods in my diet that they think would “clog” my arteries or make me fat. Sure, when I first started it was very difficult to overcome the negative propaganda I’d always heard about eating fat but the proof in my weight loss and health improvements helped to calm those fears. With all the scientific evidence coming out in support of dietary fat, especially saturated fat, consumption and less carbohydrate intake, I’m surprised people are still surprised by this message. But that’s why I do all the work that I do to share with the world that there is a better way than the low-fat, “healthy” whole grains, calorie-counting nonsense. Your brother, Kevin, tragically passed away at 41 in 2008. Can you tell us a little bit about what happened and was this the catalyst for wanting to research the truth about heart health? My full-blooded brother Kevin was four years older than me and he suffered a series of three heart attacks in the span of one week in 1999 at the age of 32 that left him with only 15% heart function. He eventually had a defibrillator put in and was in and out of hospitals for the rest of his life. The saddest part of Kevin’s story is he obediently followed the advice he was given by his cardiologist—eat a low-fat diet, lots of “healthy” whole grains, take statins, and more. That translated into a bowl of oatmeal with margarine and a glass of orange juice for breakfast in the morning. UGH! In October 2008, Kevin was in the hospital with a heart-related event when he had a heart attack. Three days later he was gone. I was already motivated to help others find quality information about diet and health. But Kevin’s death lit a new fire of passion that has not dissipated since. So, let’s delve into this cholesterol thing. What exactly is it, and why do we need it? Are there benefits to cholesterol? This may come as a surprise to a lot of people, but cholesterol is an ESSENTIAL aspect of life itself. Every single cell in your body requires cholesterol to function properly and if you had no cholesterol in your body, you would die! Cholesterol is a waxy, fat-like substance produced primarily in the liver. It is used to repair cells, maintain proper hormone levels, vitamin D absorption from the sun, salt and water balance, digestion of fats—I could go on and on! Having lower levels of cholesterol is actually putting your body at greater risk of health issues than not. In fact, those with the highest cholesterol levels actually live the longest. Cholesterol is in the body to help, not harm you. So what typically happens to cholesterol levels when someone eats a low-carb, high-fat diet? The number of small, dense LDL particles plummet. While mainstream medicine likes to focus on LDL-C and total cholesterol as the most meaningful parts of your cholesterol panel, it’s actually the triglyceride/HDL ratio that is much more indicative of your state of heart health than those parameters. The key here is lowering inflammation levels and that’s why ditching the carbs and vegetable oils is so critically important. Amen, brother! I’ve been preaching for years for people to pay attention to their triglyceride/HDL ratio. Most people that I have coached experience higher HDL levels, and much lower triglycerides. This is fantastic and is an indicator that LDL levels have lowered. But sometimes the LDL levels do increase. Since LDL is often labeled the “bad” cholesterol, could you go into a bit more depth about it and how we should look at it as a health marker? LDL-C is the number that has gotten the label “bad.” But there’s a little-known secret about LDL-C on your standard cholesterol panel that nobody ever talks about—it’s merely a calculated number. Using something called the Friedewald Equation, they estimate what your LDL cholesterol is based on all your other numbers. And for those with higher HDL and lower triglycerides as is typical of a low-carb, high-fat dieter, the calculation can be significantly skewed. That small, dense and dangerous LDL is the one that people should be most concerned about. If your triglycerides are under 70 and your HDL is over 70, you can almost guarantee that most of your LDL is the large, fluffy kind that will not harm you. That is priceless information, Jimmy. Thanks for sharing. Now, there are 29 featured experts in the book who agree with you and Dr. Westman. I know what the skeptic is thinking here: If you’re right and this is true, how come this isn’t mainstream opinion? How come my doctor says saturated fat clogs arteries and will recommend a low-fat diet to remedy high cholesterol levels? It’s slowly becoming more and more mainstream. We just saw a phenomenal feature story on a program called “Catalyst” airing on ABC-TV in Australia this week called “Heart Of The Matter” that shares the truth about how we have been led to believe the big fat lie that saturated fat and cholesterol is raising blood cholesterol levels leading to heart attacks and cardiovascular disease. There are a rising number of medical doctors, researchers and the like, many who are featured in Cholesterol Clarity, standing up to the conventional wisdom that far too many physicians still believe to be true. I don’t think it’s a purposeful deception, but there’s swelling evidence that will no longer be able to be ignored by doctors. As long as the pharmaceutical drug companies promoting cholesterol-lowering statin medications to the tune of $29 billion annually, nothing will change. There’s no money to be made telling people to eat real whole food sources of food. This is why people need to grab back control of their own health and do what’s right for them. That will very likely go against everything you’ve ever heard from your doctor. By the way, your doctor’s medical school education only gave him/her one, maybe two weeks of nutritional education at the most. He’s probably one of the most unqualified people in the world to advise you on your diet! Jimmy Moore blogs over at the Livin’ La Vida Low Carb blog, which is one of the best, most comprehensive low-carb sites on the net. But isn’t it a terrible state of affairs that this is all really down to money!? The truth isn’t mainstream because there’s no money to be made by people eating real food and making themselves healthy. How could the pharmaceutical companies get rich if we all just started eating the way our ancestors did (with no heart disease) and realized that there’s no need for statin drugs? However, a theory can’t survive long when the evidence is just not there to support it. Therefore, the ‘lipid hypothesis’ will die eventually. People will, as Jimmy pointed out, take back control of their health. If you’ve any questions on this topic, or just want to share your own experiences, please leave a comment below. Great read. And great info on the LDL that I didn’t know before. I follow Jimmy’s blog as well. Good to see you 2 team up. As always, awesome informative work! Thank you Mark, for all this. I was going to try and send you a link to the two part series about fats and cholesterol on Catalyst on ABC in Australia. As I was watching it, I could see everything that you talk about with regards to this subject. It’s really worth a look if you can figure out how to get your hands on it. 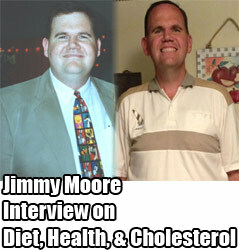 If you search on 6 Month Lipid Panel for Jimmy Moore you should find his latest update before this book. Update and Therapeutic Implications Circulation. 2007;116:1832-44. Hey Mark, Thank you for the great work. Vegetable oil appeared not all good for health. I have olive oil/ sunflower oil/flax seed oil in my diet daily. what’s your take on these oils. @Steve. Already watched it, bud. Fantastic. @Andy @Reza. When Jimmy talks about vegetable oils he’s referring to artificial oils that are chemically extracted from a plant, deodorized, and altered in certain ways. In supermarkets, it’s just called ‘vegetable oil’. That’s not what oils and fats like coconut oil, olive oil, butter, or flax seed oil are. They are separated naturally and are healthy. But stay away from vegetable oil and margarine. I don’t how about completely eliminating grains, but I’m not sure that this saying that. I do think that there has definitely not been enough emphasis on eating meat. There has to be a proper balance, and this balance differs slightly from person to person. Some people are gluten intolerant, others have different food allergies. But I think the main take home point is that foods found in their natural form are the way to go. And many diets are filled with tons of carbohydrates. However most of those carbs are the simple kind that are found in snacks. So reducing carbs may be the way to go but I think it’s still important to include some healthy natural carbs. Re Catalyst – the ABC program, there was some controversy here in Australia before the second program was aired. I heard the producer on a radio interview saying there were some medical associations calling her and the TV channel asking not to show it, arguing there might be people that would stop taking their cholesterol medication without seeking medical advice and suggestion you should always talk and follow medical advice – thing that didn’t surprise me. People are becoming carb dependent, as in, their bodies rely on carbs for fuel and their fat storage gets locked and doesnt release fat for energy, with the amount of sugars in food these days even kids as young as 5 are being diagnosed with diabetes. American Heart association is sponserd by companies that are paying billions to lie to the people, The companies that are sponsoring them…wait for it…COCA-COLA and mars bars etc..They will loose billions if the truth gets out about the damages of sugar. Thats why doctors and most nutritionists are still ant-fat. Is all about the money…not health care, They Know carbs are causing all these problems but they will continue to feed us lies, excuse the pun. But as we can see, people are starting to wake up. But the sad thing is its to late, time is coming to an end, the world is corrupt and Christ will return soon. That’s my 5cents worth! !